Residents of Harrop and Proctor are a few weeks away from taking trips Kootenay Lake on a new vessel, after the Harrop II was launched Saturday into the water at the landing located 25 kilometers north of Nelson and eight km south of Balfour. The Ministry said in addition to the new ferry for Harrop, other cable ferries are being constructed to replace aging vessels serving the community of Glade, on the Kootenay River, and Arrow Park, on Arrow Lake. 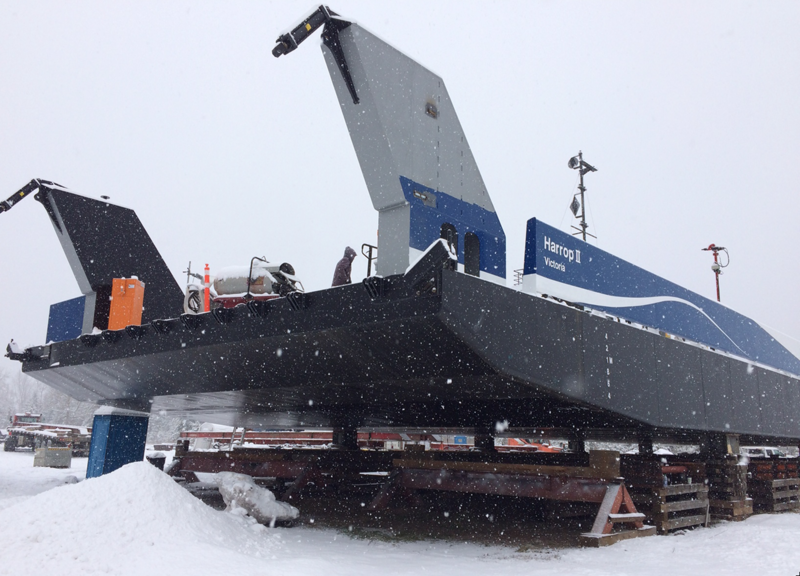 A new cable ferry to serve Adams Lake went into service in spring 2017 while the Glade II was launched in January of 2018. "The vessel was fabricated in Nakusp and assembled in Kaslo at a waterfront site," the MOTI said. 'On Saturday when the conditions where right, the vessel was relocated from the shore to the water." The Harrop II, as well as other vessels in Glade and Arrow Park, is larger and is able to carry more vehicles than the existing ferries. The new ferries have an increased capacity to handle commercial vehicles at full highway loads. There are 14 inland-ferry routes in B.C. that are operated for the Province of B.C. under contract. Five of the routes are served by cable ferries, five are reaction ferries (propelled by river current), three use free-running ferries and one is served by a tug and barge. Crews ready the vessel to be slipped onto track for the ride into Kootenay Lake.